Home » News archive » SEAX: Releas…s." SEAX: Release New Album "Fallout Rituals." 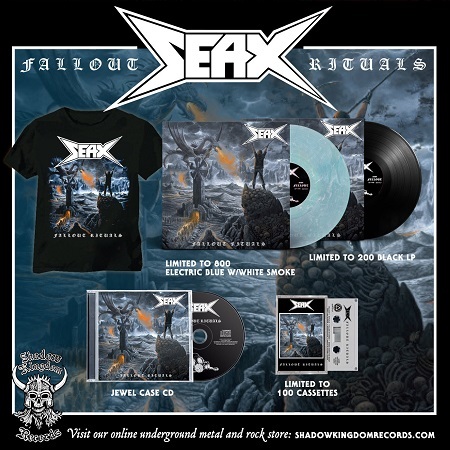 SEAX - Fallout Rituals is set to be released in stores on April 5, 2019! Check out the single, "Killed by Speed"! SHADOW KINGDOM RECORDS is proud to present SEAX's highly anticipated fourth album, Fallout Rituals, on CD, vinyl LP, and cassette tape formats. A fixture on the true metal scene, Massachussetts' SEAX are a staunchly DIY and hard-touring group. Founded in 2009 with the intent of playing classic heavy metal, it was 2012 when SEAX's first album arrived with the aptly titled High on Metal. Completely DIY, it set the standard for which the band would follow. Two years later came To the Grave, further intensifying SEAX's by-now-speeding sound and underlining their independent spirit. But it was 2016's lay-it-all-on-the-line Speed Metal Mania where the band really came into their own, seemingly perfecting their infectiously classic speed metal sound. That is, until Fallout Rituals, where SEAX have truly come into their own. Like some long-lost Cobra Records or Mausoleum release from '84, SEAX come roaring outta the gates with gleaming chrome and billowing exhaust, heading down the highway literally high on heavy metal. Old Canadian and German gods are hailed, and they see that all is right and righteous with SEAX; there's no faking this kind of authenticity, this timeless and unbending pursuit of total speed metal. Soaring vocals, exploding solos, locomotive drive, clear-yet-cutting production, absolute desire and desperation at every turn: Fallout Rituals is once again aptly titled, so focused is their pistons-pumping push. Naturally, elder British spirits likewise linger across this landscape, and they are suitably pleased with SEAX's speed metal mania. The more things change, the more they stay the same…we've heard it all before. But hearing Fallout Rituals is believing SEAX, and they will convert you yet - or just plow through you like the evil invaders that they are!